While these new leaked sketches of the 2014 Chevrolet Corvette only show so much of the upcoming American supercar, they offer what seems to be a good look at the rear end, the dash, the gauges, the seats, the engine bay, the steering wheel and the side profile of the seventh generation Corvette. We also get a somewhat crude look at the front end in the engine bay shot that shows the new headlights of the 2014 Corvette. It is hard to say exactly where these images would have originated but based on what we can see, it looks as though these drawings would have either appeared in intercompany materials such as a dealership service manual or possibly the owner’s manual – although they to appear to be a bit under-detailed for something destined for the hands of the Corvette-owning public. These images surfaced via the enthusiast network Corvette Forum and while they were later removed, a TorqueNews reader was good enough to send them over to my inbox. The most exciting of these 10 leaked 2014 Chevrolet Corvette images shows the revised rear end that looks to be like nothing the world has seen on the Corvette in the last half century. Gone are the dual circular lenses that have been featured on every Chevy Corvette ever sold and in their place are angular taillights that are similar to those used on the European Chevrolet Camaro with two distinct lenses on each side sporting inward angled lines. These new taillights are set in a rear fascia that has a smooth molded upper area with a separate lower portion that looks like it may be finished in some contrasting color with reflectors running side to side in the upper area while vents run top to bottom on the outer edges. Higher up on the picture of the C7 Corvette rear end we see a set of quarter panels that are flat while still appearing to have a raised design while the narrow greenhouse area flows to the rear end with an inward taper that includes a molded rear spoiler. 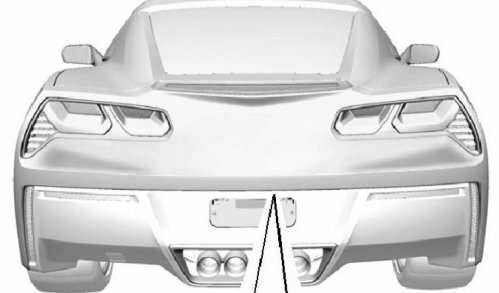 There is also an image showing the back hatch open – giving us a look at the design of the front seats along with an idea of how long the cargo area of the 2014 Corvette will be. Next, we get a look at the side profile of the 2014 Chevrolet Corvette and based on what we have seen in other leaked images and teasers – this is pretty much what we expected. The overall shape of the C7 Corvette is clearly a modern representation of the exterior design worn by the previous generations of the GM supercar with slightly sharper angles than the C6. Of course, the front end with the stretched headlights and the new rear end is distinctly C7 but in looking at this side shot, there is no mistake that this is a Corvette. The gallery on the right (click any thumbnail for a closer look at all of the new 2014 Chevrolet Corvette leaked images) also includes a shot of the front end with the hood up, showing the new LT1 engine tucked neatly into the engine bay. This image also shows us a bit of the front end – although there is very little detail in the non-engine bay portions of this particular drawing. The rest of the new 2014 Chevy Corvette images show features of the interior including a close up look at the steering wheel with what looks to be full sound system and hands-free phone system controls. More importantly, there appears to be a set of shift paddles mounted on the back of the C7 Corvette steering wheel for those who opt for the automatic transmission. There is also a diagram that shows the entire dash with a clear cockpit design built around the driver of the 2014 Corvette. This includes a large infotainment screen with buttons and knobs for both the sound system, the navigation program and the heating/air conditioning controls mounted below. There are plenty of other buttons across the dash that we cannot yet identify along with those found on the steering wheel. We also get our best look at the gauge cluster of the 2014 Corvette with a speedometer on the left side, fuel and temperature on the right side and a central tachometer wrapped around the driver information display. Finally, this new batch of leaked 2014 Chevrolet Corvette images shows what appears to be a track day screen that will likely be an optional feature of the large dash mounted infotainment screen. This performance telemetry screen looks like something straight out of a video game with a map of the track in question, a lap timer, a speedometer, brake and throttle input meters, a gear indicator, a steering angle indicator, a linear tachometer readout, an G-force gauge and a readout of which traction mode that the driver has chosen. This looks to be similar to the “Track Apps” offered in the Ford Mustang or the SRT gauges offered in current Dodge, Jeep, Chrysler and SRT vehicles – although the Corvette appears to offer even more features with the addition of the track display and timer. The 2014 Chevrolet Corvette will make its grand public debut at the 2013 Detroit Auto Show in Cobo Hall after making its first appearance at a private event on the eve of the big Motor City show. A special thanks to Max for sending these pictures over!